It was one of those days that makes me wish I could go back in time and tell my past self: "See? Things didn't turn out so bad after all. Don't worry so much." I got a promotion, for starters. I'm now Manager of Content Writing. My boss invited everyone in the company downstairs to announce the news. We celebrated with cupcakes. 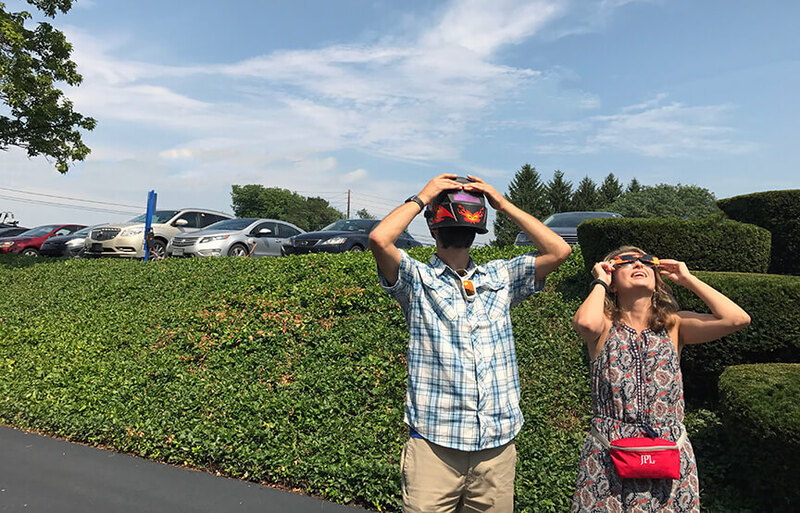 Then we all went outside to watch the solar eclipse. Some people had made pinhole viewers out of cereal boxes and tin foil. Others brought welding masks. I hadn't bought special glasses, but there were enough for everyone to share. We aren't in the path of totality, but the partial eclipse still created an eerie atmosphere. One of my coworkers pointed to the ground. The light shone through the trees in little crescent shapes. Some writer friends joined me for lunch at the office. We holed up in a conference room and critiqued each other's work. Both women have read parts of my memoir over the past few months, so they know what it's about and where it's going. They gave me some helpful feedback on chapter five, and renewed my motivation to push forward. When I got home, the boys were busy playing in the bedroom. The old-fashioned kind of playing, with actual toys, and nary a screen in sight. "Notice they're both not crying," my husband said. A situation almost as rare as a solar eclipse. He made us grilled cheese sandwiches and vegetable soup for dinner. I surprised the oldest with a leftover cupcake I'd brought home from the office. We spent all evening having pillow fights, and not crying.